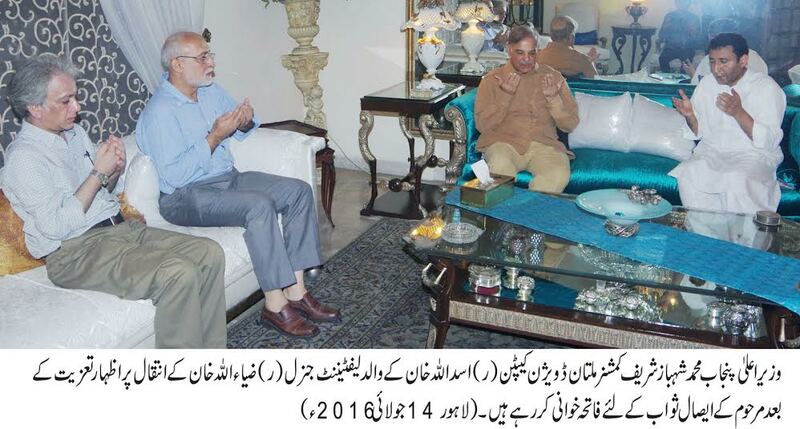 Lahore : Punjab Chief Minister Muhammad Shehbaz Sharif went to the residence of Commissioner Multan Division Capt. (Retd.) Asad Ullah Khan at Cantt. today and expressed condolences over the death of his father Lt. General (Retd.) Zia Ullah Khan. Expressing sympathies with Commissioner Multan Division Asad Ullah Khan and the bereaved family, the Chief Minister paid homage to Lt. General (R) Zia Ullah Khan on his services for the country and army. He also offered Fateha for the departed soul.